There is no question that the final season of HBO’s Game of Thrones is an event. The hype, which we looked at last week, was overwhelming as everyone anticipated the debut of Season 8’s first episode. 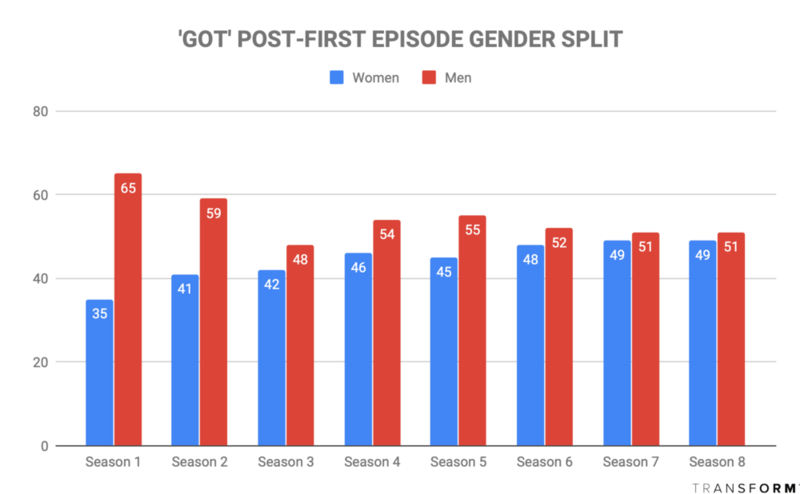 When it comes to reactions about the debut episode, the gender split has shrunk to the point where Season 8’s debut mirrored Season 7’s, with a nearly perfect 50/50 split between men and women. Considering that the show’s very first episode had a gap of 35% to 65%, it’s pretty staggering that GOT was able to make up for such a deficit with women, and speaks to why the show has grown to become such a phenomenon. But the real sign of how big a show Game of Thrones has become is illustrated by the total volume of people who are talking about it the day after. The graph speaks for itself. It’s like a bunch of Tyrion Lannisters standing next to the Mountain. While we weren’t able to include Season 4 due to a lack of reliable data, we have to assume its post-first episode numbers would have been in a similar range to the other seasons, and far shy of the numbers posted yesterday. But then the next question has to be: what were all these people saying? ﻿Looking at the first online reactions after every season debut, Season 8 has actually posted the worst numbers of the whole series. And it’s not particularly close to anything that has happened previously. A full 40% of reactions to the show fell under a negative sentiment, much larger than the previous season and double digits higher than all but one of them. What does this mean? Maybe the episode was weak; maybe after seeing how it’s begun, people don’t believe the show has enough remaining time to tie up all those loose ends. Or maybe people are already expressing sadness and anger the show will be over after only five more episodes. 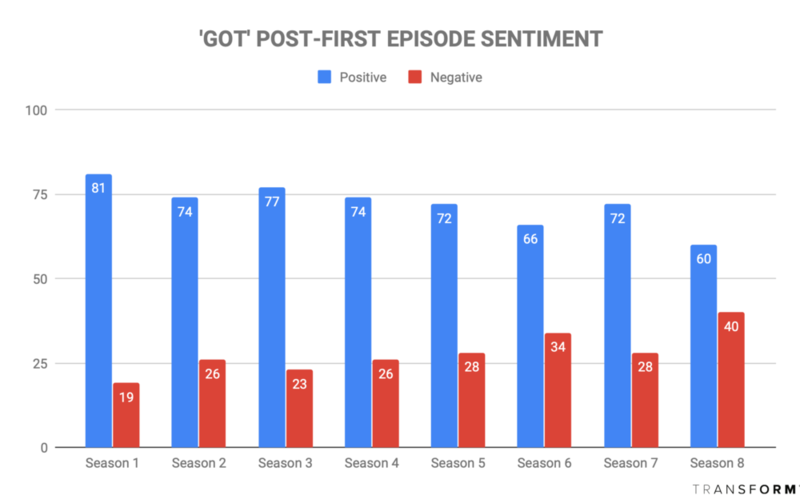 Whatever the case may be, we’ll continue tracking Game of Thrones and the online reactions to it to see how the show fares as it hurtles towards its finale.